I just started making some summer bracelets, but due to my recent (post BSBP) laziness, I decided to start from the easiest. 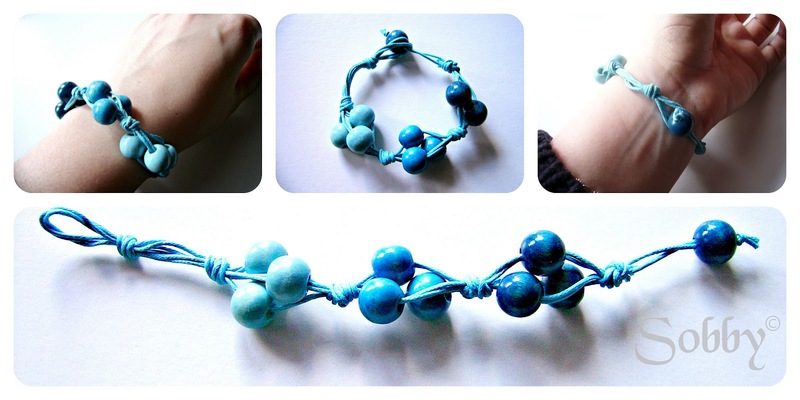 Simple knotting, 5 minutes max time (unless you realize you strung the wrong bead, or you cut your thread too short) and only 2 euros. I got these wood beads at Tiger for 1 euro. I'll let you know if they'll color my wrist with sweating, but they look just fine for now. Waxed cotton thread bought for 1,20 euro and still have plenty of both materials. Just cut 3 pieces of waxed thread (I used about 80 cm each) and fold them in half, make a knot forming a loop for your button. Make another knot leaving 2 cm space, then string 3 beads (2 threads into each bead), make another knot leaving enough space for the beads to seat at different heights. Repeat this step for each color - if you have smaller beads you might want to leave a bigger space for them to move, or just use more colors. String the bead you wil use as button on as many threads you can, make a knot and cut the others. You have one inexpensive yet fashionable ombre bracelet!